This milkshake recipe uses whole goat milk — and no ice cream — for a delicious, healthy, ice-cold treat that tastes like an entire cream pie in a glass. 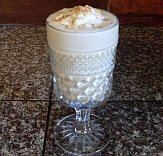 If your kids ever told you they wouldn't drink goat milk...this recipe will have them eating their words! Pour into a glass and garnish with extra graham cracker crumbs and whipped topping, if desired. Recipe makes one glass. This will disappear fast, so make extra! Articles are updated frequently, so check back here for any new information!